SEBASTIAN – Construction on the Central Railroad Corridor Greenway (CRCG) pedestrian overpass began April 26, 2017, from west of I-95 to North County Regional Park. Work of this project includes: constructing a 12-foot shared use path and a pedestrian overpass over I-95, providing pedestrians and bicyclists with convenient access to area parks, conservation areas, recreational and educational facilities; maintaining an open drainage system with swales and minor culvert crossings; and installing lighting, architectural towers, and specialty signage at the bridge location. On Tuesday night, April 3rd, two of the three northbound I-95 lanes just north of Fellsmere Road (Exit 156) will be closed from 9:30 p.m. to 5 a.m.
At approximately 1 a.m., a rolling lane closure on northbound I-95 will begin at State Road 60 (Exit 147) and continue to just north of Fellsmere Road (Exit 156), lasting approximately 30 minutes. At 11:30 p.m. the northbound I-95 entrance ramps from Fellsmere Road will have rolling lane closures, lasting approximately 30 minutes. 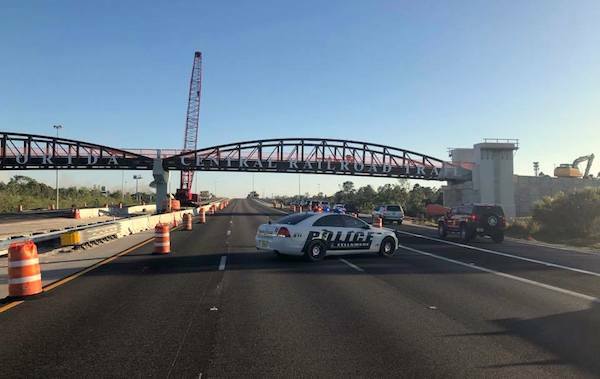 On Wednesday night, April 4th, two of three southbound I-95 lanes just north of Fellsmere Road (Exit 156) will be closed from 9:30 p.m. to 5 a.m.
We will update if we receive any new information about road closures.